Compared with Siem Reap, Phnom Penh may not have so much history and serenity. However, as one of the most family-friendly destinations in Southeast Asia and the "Pearl of Asia", the capital of Cambodia remains a charming city and has plenty of things to do for travelers with kids. So here are some of the best things you might consider doing during your family holiday in the city. The Phnom Tamao Wildlife Rescue Center is well worth a visit if your family are animal lovers. Occupying a vast area of 6,000 acres south of the capital, this wildlife sanctuary focuses on rescue, rehabilitation, care and release of wildlife and is an ideal place to see over 1,200 Cambodian animals, including crocodiles, deer, elephants, gibbons, leopards, lions, tigers, sun bears, ginormous pythons, birds etc. Most of these creatures were rescued from poachers and traffickers, and are kept in excellent, spacious enclosures where they are allowed to roam free. They will be well cared for here at the reserve until they recover when they will be released back into the wild. The center has been receiving help from Wildlife Alliances, Free the Bears and other international wildlife NGOs to improve and expand the enclosures over the years. To meet these amazing creatures up close, I recommend taking either a behind-the-scenes tour (offered by Wildlife Alliances) or Bear Care Tour (provided by Free the Bear) by giving a fixed donation. Behind-the-scenes-tour enables you to go to the feeding areas, where you can interact with elephants and macaques while feeding them, and the nursery area where you’ll see adorable baby animals. You can find out why bears are endangered and learn how to take care of rescued sun bears and moon bears on a Bear Care Tour. Both tours include hotel pick-up from Phnom Penh. 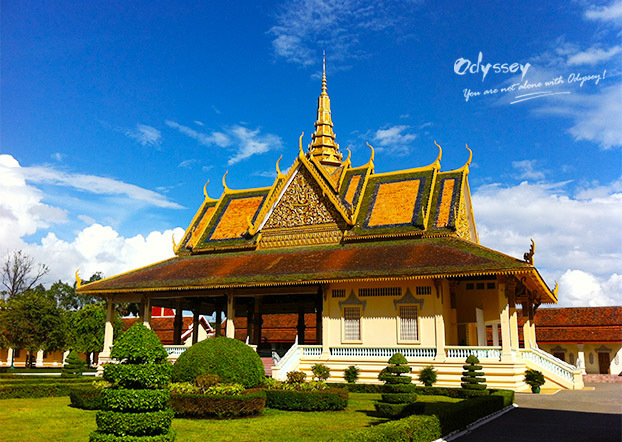 Still the royal residence of the Cambodian King, the Royal Palace is one of the most visited attractions in Phnom Penh. Though you are not allowed to access the living quarters of the King, there is enough to make your visit worthwhile. You can take a stroll with your children around the many delicately designed buildings while learning about the intriguing Khmer history and its magnificent architecture. Adjacent to The Royal Palace is Silver Pagoda whose floor is made up of 5329 silver tiles and which houses the Emerald Buddha. Wear long shorts that cover your knees and T-shirts or blouses that cover your elbow, otherwise you will need to rent an appropriate covering to enter. Avoid visiting on Sundays when Khmers from the countryside gather to show their respects unless you believe being among the crowds of locals is a good way to explore the palace. Remember to bring plenty of water as it can be hot. Note that the palace is closed for 3 hours after 11 am. The magnificent Royal Palace dominates the diminutive skyline of the capital. If you love Asian markets, you will probably love this one. 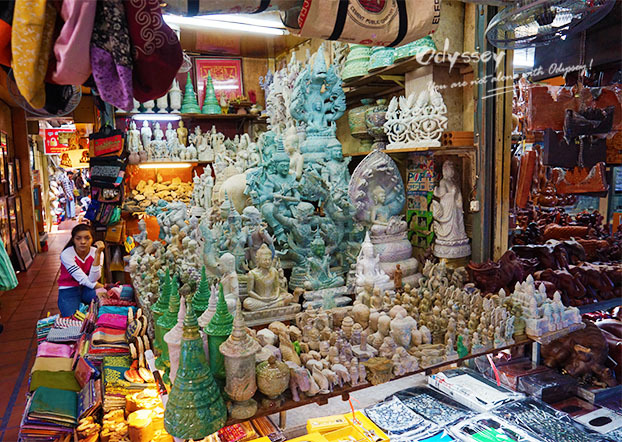 Situated in the south of the city, this charming market is just around fifteen-minute tuk tuk ride from the riverside. The bazaar is called Russian Market due to the fact that most of its visitors were expatriate Russians in the 1980s, hence the name. It is a perfect place to hunt for souvenirs and discounted clothing, and to let your kids practice negotiating skills. You will find a great variety of handicrafts and antiquities (many fake), from silks to silver jewellery, fabrics, musical instruments, miniature Bhuddhas, and more. It's also possible to shop for clothing brands like Banana Republic, Billabong, Calvin Klein, Colombia, Gap and Next at knock down prices.  Try to bargain to get a good deal as most of the items are negotiable. Be prepared to get lost and sweat a lot as the market is big, busy, hot and hard to navigate. Buy some local snacks in food stalls in the market if you feel hungry. Russian Market selling all kinds of handicrafts and antiquities. Enjoy a late afternoon cruise with your kids after a day of exploring the city. Cruising slowly at sunset along the riverfront offers you splendid views of Mekong River and some of the most fascinating city attractions such as the Royal Palace, Phnom Penh skyline and National Museum. You'll also have the chance to see charming floating fishing villages and catch a glimpse of their way of life along the way. Some cruises offer live traditional Khmer music, dinner buffet, optional drinks (beers, cocktails and coffee). 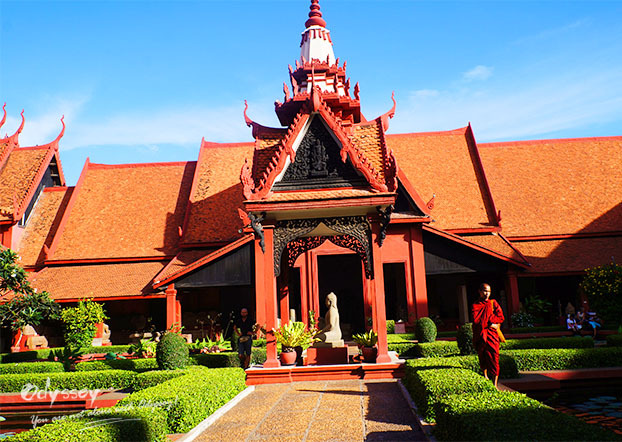 Located in the north of the Royal Palace, the National Museum houses the world's best collection of Khmer art. There is no better place for your kids to escape the heat and have fun than in the air-conditioned, child-friendly Kids City after they get bored of seeing the sights. Located in the center of Phnom Penh, this large indoor entertainment center provides a variety of entertaining and educative activities for kids of all ages. And the good thing is that you can play with them as well. Toddler Town creates safe, educational environment for kids under 4 years old to run, jump and be stimulated, with interactive preschool games, bouncy and fixed slides, tunnels, etc., all overseen by kid-friendly, well-trained staff. For older kids, there are other areas to keep them busy and happy. The Playground has a ball pool, slides, trampolines, inflatables and baby bumper cars for 4-12-year olds, which is great to burn off some of their excess energy. Clip and Climb is one of the most visited areas, with 28 different climbing walls for building all levels of skills. If your kids are adventurous, let them try the Vertical Slide and the Leap of Faith. The Science Discovery is a fun, well-designed interactive science learning zone where your kids will find out what is behind the fascinating world and play with air maze, gravity well, high wire bike and hot air balloon. Liked this post? Then share it with your friends who might fancy a family holiday in Phnom Penh. If you're planning to visit this amazing city and other cities of Indochina, we're pleased to tailor-make a family trip for you around your requirements.